Luxury gyms and fitness centres provide their clients with headphones to listen to music or watch television while they enjoy their favorite activities. Providing new sets of headphones for each guest can become costly and is wasteful. These disposable headphone covers are the perfect solution: totally hygienic, this is the only way to avoid infections because each user puts on a different set. With lice, flu viruses and mega resistant bacteria all around us, you need extra protection for your equipment and your clients. 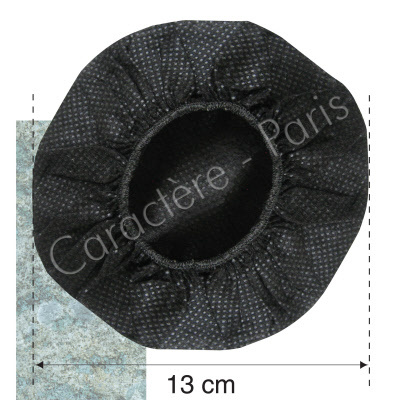 They easy to wear and fit ear pieces sized between 2 to 4 inches (4 to 10 cm) in diameter. We now offer three different sizes of headphone covers - please see the chart below to determine the right size for you. These headphone covers are also a perfect fit for the ear pieces of conventional telephones, and their size is ideal for many cellular and mobile headsets used today in the workplace, such as CN® ou jaffa®. These caps fit snugly and guarantee your client listening comfort. They provide the safety required by your guests or health inspectors, and show your respect for hygiene. Easy to use by the pair, individually wrapped and sealed for sanitary conditions. They are available by the package of 100 pairs (200 individual covers), in an easy-to-open box that can also be used to dispense the covers to clients. Powered by ShopFactory to sell P266 online. All-in one eCommerce and online shopping cart software.